Introducing a new mod, inspired by The Complete Book of Elves, Elves of Evermeet, and other 2nd edition handbooks: Eldritch Magic! Features include kits, items, spells, and much more. Comments and feedback are strongly encouraged. Please report any bugs to me. *Multiclass kits. Please read the README for instructions. New Component: "Congenio's Pebble Collection" - Allows multiple Ioun stones to stack without using any equipment slots, as per PnP. Ioun stones can still be worn as helmets, and if used in the equipment tab, will "float" around you giving you the benefits of the stone and a free helmet slot. Simply use an innate ability to reach out and grab the Ioun stone you wish to remove from orbit. This can be quite powerful by ToB. Wong Fei's Ioun Stone now also has same usability as all other Ioun stones, excluding Malla's Soul Stone, which still excludes Good-Aligned users. WARNING: Ioun stones that use Opcode "Stat: Maximum HP Modifier " work differently than others. In order for the HP modifier to be removed when the Ioun stone is, the HP modifier cannot be saved and loaded. In other words, if you save with the Pale Green Ioun Stone and/or Wong Fei's Ioun Stone equipped in orbit, you must equip them again upon loading to receive the HP modifier. [Upcoming] - Kits: Collector, Elven Minstrel, Huntsman, Infiltrator, Spellfincher, and Faiths & Powers-compatible "Clergy of the Seldarine." [v1.68] - Further improved Bladesongs! Bladesingers are meant to stick to robes/elven chain and single weapon style, but as a fighter/mage kit, they were able to perform their powerful bladesongs in cumbersome full plate and heavy tower shields. No more! Bladesongs are now properly limited to Bladesingers in armor no heavier than chain mail so long as they are wielding a single one-handed melee weapon and have one free hand. Splint/Plate, ranged weapons, 2H-weapons, shields, and even hand-to-hand combat will disable bladesinging, removing its effects and preventing its reapplication until proper weapon/armor requirements are met. Courtesy of @subtledoctor. - Revised abilities for Herbalists & Priests of Mystra, improving balance as well as kit usefulness. - A few components shifted groups (but not component numbers) to maintain a minimum number of component groups. - Bug Fixes: Multiple strref fixes, including War Wizard's innate ability descriptions. Removed all instances of 'sod' under REQUIRE_PREDICATE GAME_IS, due to the fact that IWDEE does not yet recognize that game. Fixed multiple Ioun stones for IWDEE. Also replaced 2 SoD Ioun .BAMs with closest matching images from compatible games. 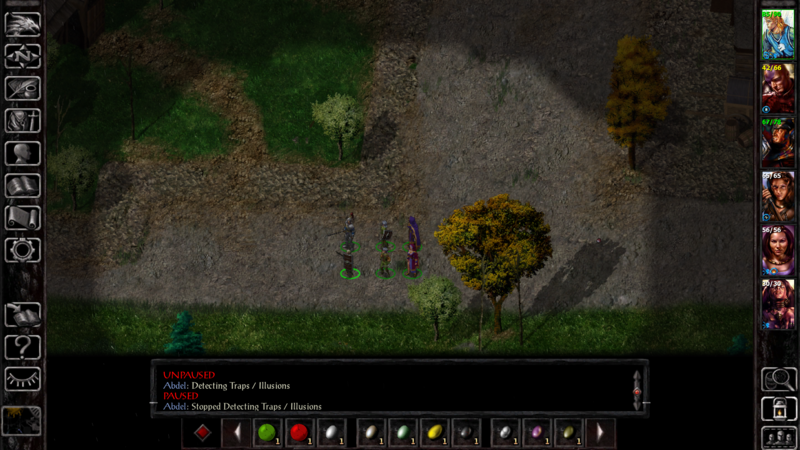 [v1.67] - Bug Fixes: Further fixes to Priestess of Lolth's 'Shapeshift: Spider,' should work as intended now. - Format changes: Component order changes, completely uninstall mod before updating. Will affect games in progress. [v1.66] - Bug Fixes: Multiclass kits will now function properly for class abilities of level 10 or above, all credit to @Aquadrizzt. [v1.65] - Bug Fixes: Resolved issue with Priestesses of Lolth being unable to talk after shapeshifting out of spider form. [v1.62] - Improved Priestess of Lolth's "Shapeshift: Spider," haste and poison come with higher levels. - Multiclass F/M Bladesinger should now have access to all available quick spell slots. - Minor item and string reference fixes, improved compatibility between BGEE & IWDEE. [v1.61] - Bug Fixes: Fixed Post-2.0 Multiclass Kits. BG2EE no longer crashes. Priest of Mystra's kit tome now works. Abyssal Warrior's free weapon & armor now function in IWDEE. - New Components: XP Cap Removal, Increased Start XP (BGEE:SoD/BG2EE), Remove dual- and multi-class restrictions. [v1.6] - Bug Fixes: fixed spells required for Congenio's Pebble Collection. Ioun stones now unequip identified. -Redaction: BGEE Item Expansion absorbed BGEE HLA component. All BG2EE Item Expansions merged into one component. [v1.5] - New Component: Congenio's Pebble Collection. Allows multiple Ioun stones to stack without using any equipment slots. [v1.11] - Removed 25STWEAP.2da made unnecessary with patch v2.1. - Disabled Alpha components for IWD2 & PS:T.
- Slight changes to custom races. Tiefling should work in BGEE, SoD, and BG2EE. Vampire should appear in BG2EE, but has no selectable classes. Removed changes to IWDEE racetext.2da. [v1.1] - Bug Fixes: Abyssal Warrior's level 1 free weapon now created in inventory. - Changes: Windrider's mount only usable outdoors. Now has no casting time like other non-magical innates. - Other: XP Cap Removal added to HLA component. Tiefling added as a playable race, essentially just an Elf with different string references. Only an Abyssal Warrior can be a true tiefling with all racial traits. [v1.0] - Kits: Abyssal Warrior, Bladesinger, Eldritch Knight, Herbalist, Priest of Mystra, Priestess of Lolth, Undead Hunter Paladin kit for Elves, War Wizard, Wilderness Runner, and Windrider. Looks interesting, unfortunately it's a bit problematic to download as is. May be Set it up as a zip or rar file might make it easier for people to download. @smady3 Thank you, you're right. Unfortunately Google Drive has some limitations, but I think the best way to download the folder version is by adding it to one's own drive. However, I also added a WinRAR zip version, hopefully that helps! 25% fire and magic fire, and 15% physical resistance. I don't get those resistances for tiefling. They are a canon race, they get resistance to *cold* damage... not fire, and certainly not physical damage. The same also did happen to the aasimar when Warriors of Heaven hit the shelves and introduced similar abilities and appearances tables. I actually agree with @subtledoctor more than @lololo555 on this matter, but I appreciate both of your ideas. The input on Abyssal Warrior is very fascinating, but check out their pnp abilities. They get a +1 to saves, and a -1 to thac0 in bright light, a free weapon and suit of armor, and then they're preferentially attacked by devils and ignored by demons. Pretty boring if you ask me and not the easiest to code the last part. They can only be humans and tieflings, so for flavor, I made them tieflings only. Rather than go pnp for tieflings, I literally just copied Haer'dalis' bonuses. Would I rather have PnP drow and tieflings and therefore change Haer'dalis' and Viconia's stats, even if nerfing them? Absolutely. But that's more difficult, so my "races" emulate existing PCs more than PnP while the kits are mostly PnP with some of my own creative interpretations. P.S. - I just finished BGEE v2.0 compatibility, check it out. @Abdel_Adrian Im not into pnp, just wanted to suggest a kit that is balanced, useful and stands out, from what i read, bioware didnt stick strictly to pnp rules. Most kit mods offer copied pnp ones which are pretty much useless compared to vanilla bg2 ones. I definitely understand your perspective, and your kit does sound very cool - but not my vision of the Abyssal Warrior. Under any other name, maybe. While my mod has a ton of creative freedom, I really did try to stick to PnP as my starting area for every kit. The 2E sourcebooks were the inspiration for the mod and I even use the same kit names and descriptions as the sourcebooks, so keeping the abilities *close* to PnP is important for me. More important though, is how feasible it is, and how balanced it is. Sometimes I wouldn't do something because it's too difficult to code. Other times it wasn't balanced- like making Abyssal Warriors immune to fear. I actually did that at first, it was absurd. They're a fighter kit and they really don't have crazy penalties, they shouldn't have crazy benefits. What does training in the Abyss give you? Certainly not magic - the Planescape book is very clear that swords > sorcery in the Abyss. So they're immune to demon fear - the very debilitating attack they must combat on a daily basis. Then they get to summon their allies at higher levels. The STR bonus only negates one Tiefling penalty and the fact that without it, their total stat roll was 1 lower than every other race. I like your ideas, but I'm actually very happy with the Abyssal Warrior's current fusion of PnP and "balanced" roleplay-like abilities. The only thing I would like to change is making the Tiefling (and Drow) *more* PnP, and then changing Haer'dalis (and Viconia) to reflect that. But if you're interested, check out the 2E complete book of elves, complete book of bards (for elven minstel), and Planescape sourcebook - see how my kits both reflect PnP and defy it. They must fit into BG first and foremost. Bladesinger rocks the house. That is all. Hey @Abdel_Adrian are your beta HLA and XP Cap Remover standalone mods or do I need something else? I was thinking of downloading an XP Cap Remover but if your mod already does that I don't need to worry about it. Edit: Well, I just tested it out(was afraid of breaking my game, but WeiDU's easy enough to reinstall) and it is standalone! For those wondering. Iirc, a lot of modders ( @Abdel_Adrian included ) use those components as utilities in their own mods. The XP Cap Remover was something created specifically for that purpose, I think. @Traycor Thank you very much! Every single kit in my mod initiates an XP Cap Removal, but I don't have a component that removes the xp cap w/o adding a kit. It actually would have made a lot of sense to add that to the HLA beta component, and I think I'll do that, but I should point out that the HLAs don't yet work in SoD and I'm still working on a fix. As a side note, SoD also broke the Abyssal Warrior's free weapon at level one, will fix very soon. Might be majorly noobing out here. But I can't seem to select Eldritch Knight. If I pick Fighter/Mage I don't get a second screen for specialization. The single class kits are all there, just not the multiclass kits. @Ysil69 That is correct and is functioning as intended. All multiclass kits (Eldritch Knight, Priest of Mystra, and War Wizard at the moment) require that you first select the appropriate race and multiclass combo, and then only once you are in-game can you assign the kit. This is done with a tome that can be bought from the very first vendor in any EE game (Winthrop, Pomab, etc.). All of this is described in detail in the README, so it's a good idea to check that out first if you have more questions. Hope this helps. I'm having a lot of fun with this new component I just added. Congenio's Pebble Collection lets you use as many Ioun stones as you want even with a helmet, as per PnP. It's obviously more powerful than Ioun stones were ever intended to be in these games, so keep that in mind. On the side of balance though, is there a limit to how much of a single type of stat effect applies at once? For instance, if you equip a ring with +1 AC bonus, then you cannot also equip a necklace with +1 AC bonus. (Obviously, it prevents stacking.) Is your component the same way? Nope, it's incredibly overpowered, but I'm okay with that. In BGEE there are only 5 Ioun stones and in IWDEE there are only 3. You get them relatively late in the game and pretty far between, so it's unlikely that you'll ever have as many Ioun stones floating around you as Larloch does. A little more testing is necessary, but I'm not too concerned with stacking the same effects because there's a finite number of each type of Ioun stone, and in PnP you are technically allowed to have dozens of Ioun stones floating around you, a helmet equipped, and a ring of protection +1 too. If people choose to use this component, I have no way of making them increase the difficulty, or use SCS, so it's really up to them as far as how they want to balance this increase in power. Ultimately it's not too broken until ToB though. I love the newest component as it imitates PnP very well even if it might be a bit overpowered. Any plans to make your mod available as a part of a BWS install? I hadn't really thought about it, but that actually sounds like a really good idea. I'll contact BigWorldSetup and see about making that happen. This mod looks fantastic I'm having a blast with Bladesinger in BGEE. One day I wanted to check it out in BG2EE, but unfortunately I have a strange bug. When I start new game, instead of Irenicus dungenon, I see only blackscreen and hear sounds from Tethyr forest. After few seconds my char die. I tried it on the fresh install so it's not because of conflict with another mod. TOB starts without a problem. Wow that is very odd, I wasn't having this problem before 2.1, but I can replicate it now despite no change to my mod. It affects other kits as well, even if those kits aren't being selected, and it's not a consequence of other components in my mod as I tested them individually. I can't explain why the same kits work in BGEE, SoD, ToB, and IWDEE, but not SoA. The components that work on items and spells still function fine, but something is going wrong with all my custom kits, not just bladesinger. I'm sorry for the inconvenience, but I really appreciate you pointing it out. I'd like to fix this as soon as possible. Does this happen with kits from other mods, or just from this mod? If just this mod, will it happen if any kit is installed, or just specific ones? I haven't tested any other mods or mod interactions, but it definitely seems to be happening with even a single one of my kits installed, regardless of kit. It even affects the core classes and kits inherent to the game, so it really renders SoA unplayable. The kits listed in the description are individual components and I experienced the problem with at least 3 different kits installed one at a time, I assume it's affecting all of them since there's really nothing there but ADD_KIT. Just re-read the thread - it says every kit in this mod involves removal of the XP cap... why? Why not let the player decide separately 1) whether they want to use these kits, and 2) whether they want the XP cap removed. Try removing that code - maybe that 'death-at-start' thing is from buggy edits to startare.2da or something like that. It was startare.2da, I must have replaced the BG2EE file with the BGEE one by mistake at some point, I feel really silly now. This will definitely be resolved in the next version I upload, but a quick fix for now would be to simply delete startare.2da from override if and only if you're playing BG2EE:SoA.